To help support those affected by mental illness, $5 from the sale of every Sakura Necklace is donated to the Canadian Mental Health Association (CMHA). Mental illness affects everyone, whether it be directly or indirectly through a family member, friend, or colleague. In Japan, doctors routinely prescribe “forest bathing” for optimum mental health. Cherry blossom or sakura season is the perfect time for this. 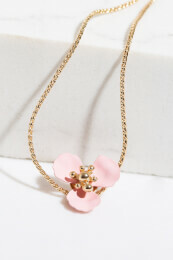 Embrace the beauty of these blossoms with this delicate flower necklace, the perfect accessory to add to any outfit. It has an adjustable chain that allows you to customize the length to your liking.